He’s tall, blonde, and handsome, but this member of Seventeen Magazine’s Hot Guy Panel has extreme intelligence, modesty, and a groundbreaking business vision to accompany his good looks. 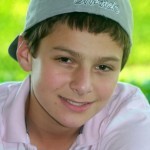 Connor Ellison was born and raised in Los Angeles. The California native loves his west coast home because of the climate: “The weather is always constant and a good temperature. I love it because I am such a cold person in general.” By that, he means he easily becomes chilled, because this guy has a huge, warm heart. Connor has a younger brother who is almost 16, and the two are extremely close. Connor was a member of the 2013 Hot Guy Panel in Seventeen Magazine. The casting process started out similar to any other. “My agency contacted me about applying. It was a pretty average process, at least for the first round. I sent in some photos and answered a few questions.” Each round, however, became increasingly more difficult, and the entire ordeal took roughly four months. “I just kept thinking how lucky I was when I made it past another round,” Ellison recalls. He even more vividly remembers the day he discovered he had officially made it onto the panel. Connor’s mother explained that if he had an incoming call that day from the corporation, it meant he had made it. “I received a call in the middle of biology class, and as soon as I saw the call was from New York, I immediately started freaking out.” Pretty soon after the call, Connor was flown out to the New York headquarters to meet the staff and rest of the panel. The headquarters were within close proximity to Central Park, and before he knew it, Connor and the others were centered in Central for a photoshoot. Although Connor enjoyed his time on the panel as well as modeling, he has several other passions he hopes to pursue. Some of his favorite activities include camping and backpacking. Connor recently achieved the ranking of Eagle Scout, a 14 year-long process, and hopes to go backpacking in Europe this summer with all his newly acquired equipment. He also loves attending music festivals, which is where he and a friend first got their company’s idea. This 18 year old launched his own company in 2013, The Afterglow Experience, which specializes in selling glasses that alter the way light is perceived, perfect for any concert or music festival. Connor’s future is so bright, he needs to invest in a pair of his company’s shades. Currently finishing his senior year at the all-male Catholic Loyola High School in LA, he plans to attend Loyola University in New Orleans in the fall. The university awarded Connor a scholarship to continue his business while there, where he will also earn his MBA in a five-year program. For more information and updates about his business, you can follow Connor’s company on instagram (@theafterglowexperience) or twitter (@afterglowexp). 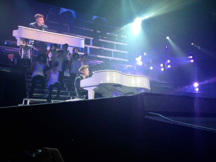 The Justin Bieber concert January 26, 2013 was as hectic as any Saturday in Miami Beach could be. After hours of hair, make-up, and a long car ride we finally arrived at the American Airlines Arena at 3:00 pm. We quickly secured our spots in the meet and greet line along with hundreds of other devout fans. After what seemed like hours of applying and reapplying lip gloss and mascara, we made our way into the backstage area of the arena. We truly got the backstage experience: meeting Justin’s road manager, Kenny Hamilton; grandparents, Diane and Bruce; stylist, Ryan Good; lead guitarist, Dan Kanter; and even influential movie director, Jon M. Chu. 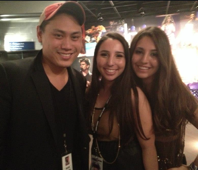 Jon Chu was nice enough to stop and talk with us about the possible production of a new Justin Bieber concert movie. He even told us that they would be filming for this movie that night. Finally, the glorious moment occurred. We made our way over to the meet and greet room. We were surrounded by nervous girls, some were even crying. As we moved further and further towards the front of the line, we could hear the cameras flashing. Butterflies instantly filled our stomachs and we finally understood what everyone around us was feeling. We were finally at the front of the line and we couldn’t believe it. We knew this would only last seconds so we prepared our entry plan, which didn’t go so well. As we walked in, Marlee tripped on the carpet (or as some people might call it the air) and fell right into Justin Bieber’s arms. He sweetly caught her said in his high pitched voice “Woah, don’t fall now.” We proceeded to pour our feelings out to him which involved many I love you’s, you’re my inspiration’s, and you’re so hot’s. We were shoved out of the space and told to leave the room and make our way to our seats. We made our way down to the floor pit and approached our fabulous seats. The concert was scheduled to begin at 7, but typical Justin didn’t set foot on the stage until 8:45. Once the concert started, everything was a blur. His performance was fantastic and he ended the show with a bang when he emerged from backstage for an encore and sang his hit song Baby. Even though we weren’t chosen to be the One Less Lonely Girl, we still felt special. Justin has a way of making girls feel like they’re the only ones in the room. The rest of his tour, and of course, his movie will be amazing. We enjoyed every second of it, especially those special 15 we spent with Justin Bieber. 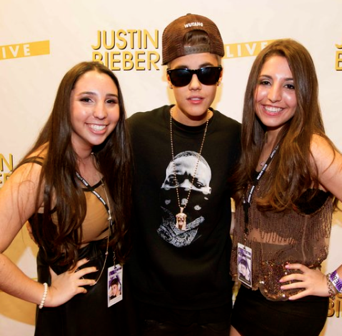 BOCA RATON — This weekend, no one had Bieber Fever like Lexi Segal. In December, the 14-year-old eighth-grader entered a contest to win a meet-and-greet with Justin Bieber, the teen singing sensation, Saturday night at AmericanAirlines Arena in Miami. Contest rules were simple: Take a picture of your Bieber-filled room and send it to Bieber’s fan club. Friday night, Lexi, who lives in Boca Raton, found out she was the lucky winner. On Saturday, Lexi realized her dream of meeting Bieber in person. 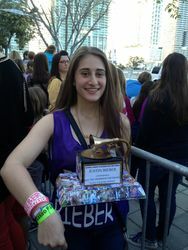 Before taking a picture, Lexi had an opportunity to present Bieber with a gift — a homemade music award that resembles a Grammy. Lexi described Saturday’s concert as the “best show I’ve ever seen.” She was returning to AmericanAirlines Arena with her mother, Aimee, Sunday for an encore performance. Aimee Segal said her daughter’s room is a hallowed shrine to Bieber who has more than 33 million followers on Twitter. “It’s covered from top to bottom in posters, pictures, books and magazine articles,” she said. Lexi said when she first heard Bieber sing, she fell in love with his voice. But that quickly changed as she learned more about him. “At first (it was) his music, but then just what he does for other people,” she said. “Everything about him just grew on me to make me the fan that I am today.